Getting there: The park resides on the north side of Bull Creek between the creek and Spicewood Springs Road. 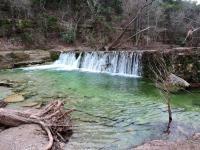 From Hwy 360, take Spicewood Springs west for about two miles. Be on the lookout on the left for a small parking area to the left with a white mailbox. At this spot there is parking for at most 4-5 cars parked parallel to the road. This is not the spot we parked in on this visit as it was already full. Alternatively, proceed down Spicewood Springs for at most a quarter mile and look for a larger parking area on the left. This parking area can hold about 15 cars. 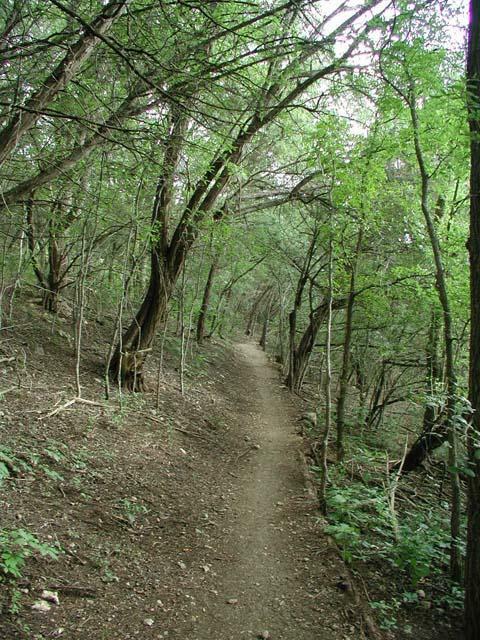 The Hike: St. Edwards Park is a hidden gem in northwest Austin that most people don't know about. Running along the northern bank of Bull Creek and Spicewood Springs Road, its presense is missed by some who even drive on the road due in part its small parking areas. However, the park is not devoid of people and its trail's close proximity to the road reminds the visitor that civilization is close by. 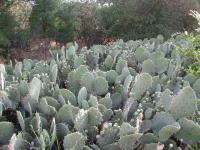 Right at the start of the trail is the largest single stand of cacti you'll see in the Austin area. 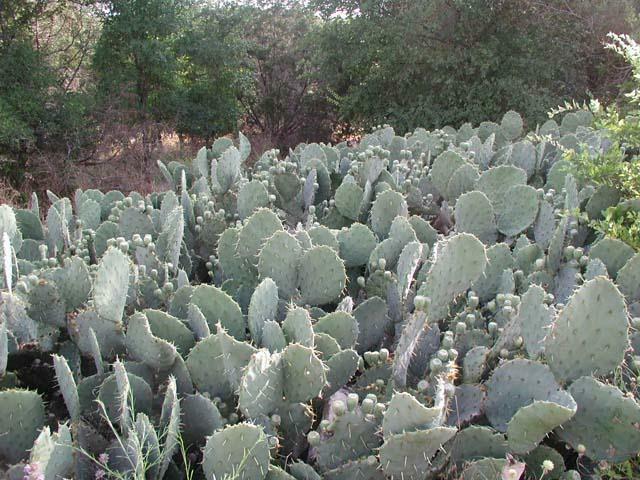 The trailhead for our hike is located at the "large" parking area, right next to the largest stand of cacti you're likely to see. The large mass measures at least 10 feet across and is the largest single stand we've ever seen. Just on the other side of the path smaller patches of cacti indicate that the conditions right here for the plant are excellent. 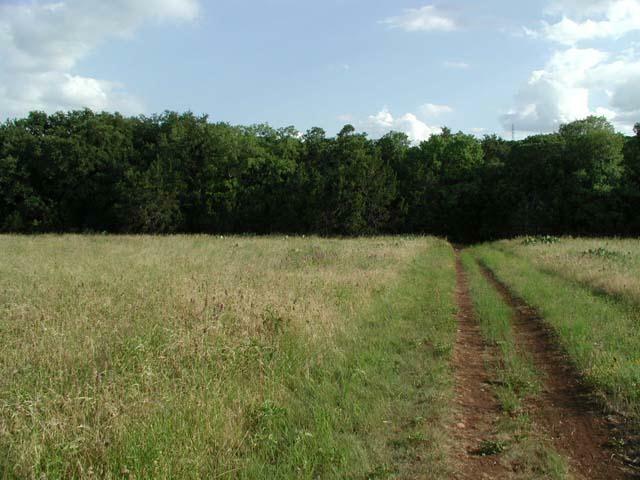 The beginning of the trail is dominated by pocket prairies covered in grasses and wildflowers. Follow the trail down to a T section, not far from the start. Take a right and proceed down the trail through the park's pocket prairies. 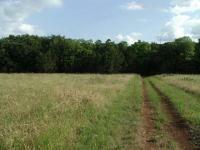 These small, treeless grasslands between lines of trees host a number of wildflowers. At this time of year the Indian Blankets and Brown-eyed Susans were out in abundance. As the trail gets closer to the creek the grassland will give way to a heavy tree cover. 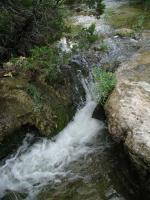 The bulk of the land that makes up St. Edwards Park lies in a bend along Bull Creek. However, the majority of the hike is north of the bend along the thin ribbon of the park that extends almost to the Oak Grove Cemetery. The trail heads toward the creek when coming up to Y's or T's in the trail take a left to get to the waypoint marked "4-way". Turn right at this point to start paralleling the creek. From now on the trail will be easier to follow as they are few, if any possible detours. Most of the trail follows Bull Creek and is heavily wooded. There are several waterfalls along the trail, the first of which is notable for one of the trees that stands there. 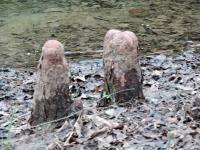 Many years ago someone decided to cut down one of the trees that lines the bank of the creek. The tree had other plans however as it allowed the saw to cut into it enough to grab hold and never let go. The lumberjack is long gone and saw blade is rusty with age, but the tree remains and is growing around the saw used against it. The main slot the waypoint Waterfall provides noisy, fast moving water contrasted with the still, quiet pools nearby. Just north of the saw tree is a hidden box containing toys and trinkets. The St. Edwards cache is a part of geocaching, a modern day version of the treasure hunt that uses GPS receivers to track down packages left behind by others. The game works such that anyone finding the cache can take an item, but they must also leave an item for someone else. The waypoint file listed below includes a waypoint for the cache, in case you want to give the pastime a try. 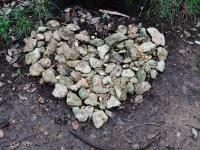 You can find out more about geocaching on Austin Explorer's geocaching web page. The best waterfall to be found on this hike resides at the waypoint "Waterfall". Here most of the water flows quickly through a slot near the far bank. 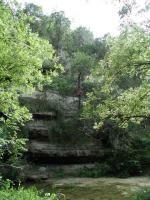 A broad uneven rock ledge spans the creek and is covered with small pools of water intermixed with rock highpoints providing footing to walk across. 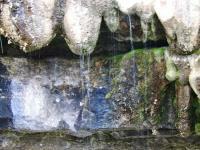 Two smaller waterfalls spill out over the the rock ledge. The small pools of water provide an ideal habitat for tadpoles and small frogs, of which there are many here. When walking across the rock please be aware of the pools and the small frogs that might be hopping across the rock. The main falls ledge provides excellent habitat for tadpoles. The main falls slot is on the other side of the couple pictured. 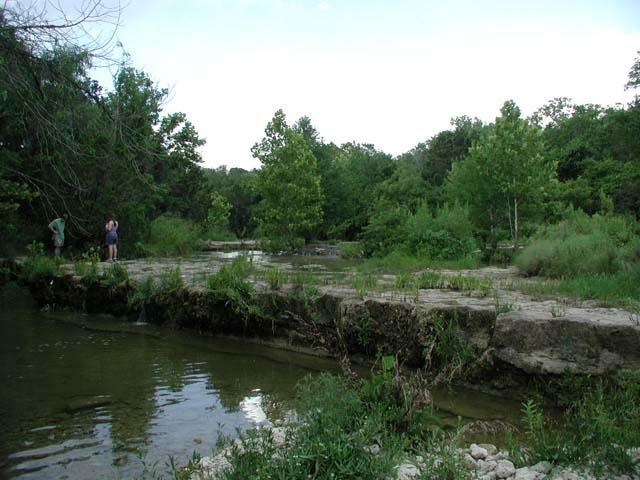 When the trail gets near the waypoint marked "Low Water Crossing" the trail will pass right along the edge of Spicewood Springs. Be very careful when walking along this and other stretches that pass close to the road for any wayward drivers. The low water crossing is built on top of a small waterfall, which probably provided a stable platform of rock for the road. The land on the opposite bank at this point is private land so keep that in mind when looking for other trails on the opposite side of the creek. The trail is not very hilly, though the evidence of hills abound. At the waypoint marked "Cliff" a small side spur heads to the water and provides an impressive view of a shear rock wall on the opposite bank. 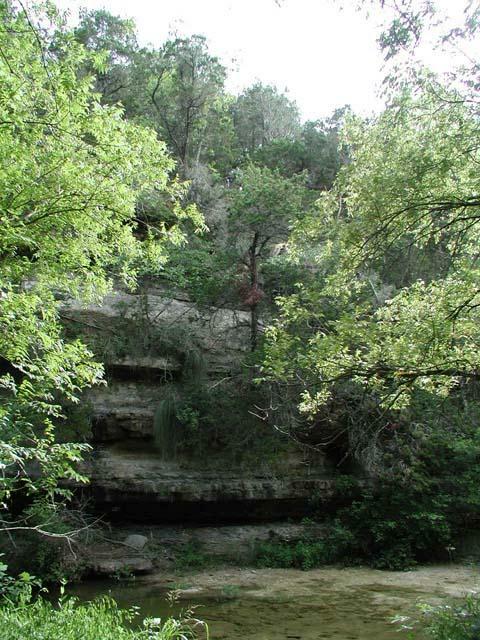 The hike is largely flat, but this cliff overlooking Bull Creek makes it presense known. This is still the Hill Country. The waypoint "Turnaround" is the point at which the trail appears to end. We say appears to end because it runs right into the road with no visible sign of continuation on this side of the road. Spicewood Springs is crossing Bull Creek again and so the trail has run out of land. However, there seems to be a trail that continues on the opposite side of the road. We don't recommend proceeding across for 3 reasons. One, any trail that exists on the opposite side ends shortly halfway up the hill. 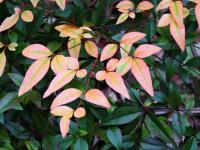 Two, the land may be private land since it appears to be in some stage of development. Lastly, the land is rife with garbage. Construction workers and/or local teenagers have littered the landscape with various refuse including broken beer bottles. It is not the prettiest site to see, so why waste your day on it? The garbage at the end of the trail brings up a point about garbage at St. Edwards. While not nearly as bad as the garbage dump mentioned above there was a bit more trash here than we would like to see. On the way back to the trailhead we picked up as much trash as we could fit into a trash bag we brought along just for that purpose. We could not get all of it, but we made a difference. You can too. When hiking at this or other trails please do your part and leave the trail in better shape than you found it. All things considered, this is an enjoyable hike. We covered 2 miles out and back in one hour and forty five minutes while enjoying Bull Creek in less crowded conditions than can be found further downstream. It's an easy hike with very little elevation gain, though you are still afforded a couple of beautiful views of the surrounding hilly terrain. Again, I do not understand why these are broken into 3 different hikes. Also, it seems ther is nothing listed for the hike crossing over Spicewood. I have never seen anyone on that side of the road. We saw a horse and rider and this hike and one other person with a dog. THis is a great hike. This hike was great for just rambling along one morning. There were not many people on the trail. It was not very difficult. It was just a great little hike. I really enjoyed this one. There are people and dogs, and it runs along the road for some of the ways but overall it was great. Enjoyed dipping my feet in the water. Massive field of blue bonnets. Will return again. Easy hike up the stream. Was fun going off trail and playing frogger on the rocks in the less than 1 foot deep water. Theres a rope swing at what looks like a cool place to go swimming. We will probably come back in the summer. Slight elevation gain if you don't just follow the path that goes up the stream, but its nothing too difficult. A couple of girls here jogging but no other people. Very nice in parts. Was okay but rather short and not too exciting. I prefer the Bull Creek hike down the road. The creek was very low. There were small pools in spots, packed with small fish with nowhere to go. It's been raining lightly for the past two days, so I'm hoping those poor fish are getting some relief. In short, it just wasn't an enjoyable hike for me. (If you want to call it a "hike.") When it's cooler, I'll give this trail another shot. We hiked the full two miles out and back, and I was disappointed to see that the vast majority of the trail consisted of walking along a narrow (sometimes muddy) path nestled amongst waist-high greenery in the woods. It was enjoyable and the many spurs over to the creek afforded nice views (and many, many frog sightings! ), but I was hoping for something besides the vanilla sameness that pervaded all but the first few minutes of the trail. Don't get me wrong -- it's a nice walk, but a destination like Comanche Bluff Trail would have been much more enjoyable. Written in narrative style, this comprehensive, general survey of Texas history—from early times to the present—offers a balanced, scholarly presentation of all eras and topics. It explores the full range of political affairs, social issues, and economic developments, as well as ethnic, racial, and gender issues. The Country and Its Native Peoples. Exploration and Occupation 1519-1763. Spanish Texas 1763-1821. Texas Under Mexican Rule. The Prelude to Revolution 1826-1835. The Texas Revolution 1835-1836. The Republic of Texas 1836-1845. Early Statehood 1846-1861. Pioneer Institutions. Secession and War 1860-1865. Reconstruction 1865-1874. From Reconstruction to Reform 1874-1890. The Advance of the Frontier. In the Age of Reform 1890-1910. Life at the Turn of the Century. Crusades and Complacency 1910-1930. The Great Depression 1930-1941. World War II — and After 1941-1962. Politics of an Urban Land 1962-1996. At the End of the Century. For anyone interested in Texas history.